Take on a range of tasks such as sealing faucets, valves, and flanges with these multipurpose O-rings. They are available in different elastomers to provide the chemical resistances and physical properties needed for your application. All inch sizes conform to AS568 standards for dimensions and tolerances. With excellent resistance to petroleum oils and gasoline, these Buna-N O-rings are a good choice for general use and low-pressure hydraulic and pneumatic seals. Buna-N, also known as nitrile rubber, is a strong, abrasion-resistant material that also offers good compression set resistance to minimize loss of resiliency. Resistant to a broad range of chemicals, these Viton O-rings are often used in equipment for chemical processing, paper and pulp production, and other harsh applications. Viton is compatible with most acids, petroleum oils, fuels, silicone oils, and greases, and has excellent compression set resistance to minimize loss of resiliency. Offering greater resistance to chemicals than standard Viton, Viton ETP O-rings can withstand bases, amines, and other caustic solutions. They are a good choice for extreme environments, but are less resistant to compression set. For applications where you need heat-resistant seals, choose silicone O-rings for their stability at high temperatures and resistance to aging. They are typically used as static seals in food processing and in dry heat applications. 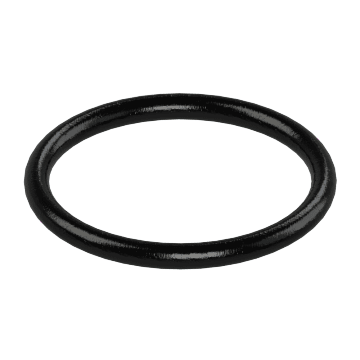 Use these EPDM (ethylene propylene diene monomer) O-rings where you need a seal that withstands heat, steam, water, or ozone and is compatible with diluted alkalis and acids. EPDM is a rubber-like elastomer that maintains its flexibility in low temperatures to conform to grooves and surface irregularities. 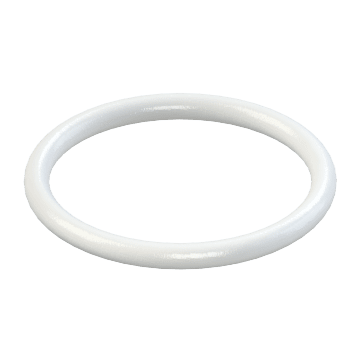 Made of a semi-rigid plastic, these PTFE (polytetrafluoroethylene) O-rings have excellent tensile strength and chemical resistance, and are stable across a wide temperature range. They have low resilience, making them a good choice for crush seals, and a low coefficient of friction for applications where you want an O-ring that won't stick to components. 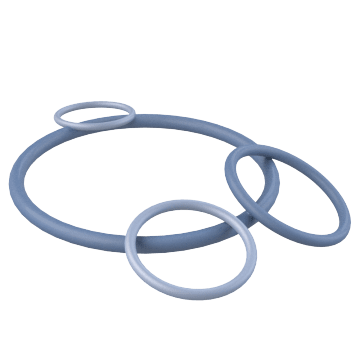 Combining the resiliency of an elastomer core with the excellent chemical and temperature resistance of FEP (fluorinated ethylene propylene) shielding, these FEP encapsulated O-rings are a good choice in most harsh chemical environments. Commonly used in valve, pump, and pipe linings, FEP withstands petroleum products, phosphate-esters, steam, and heat. 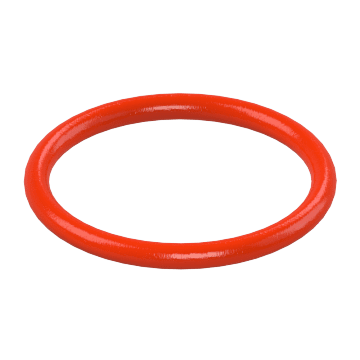 A common choice for refrigeration and cooling applications, these neoprene O-rings are compatible with refrigerants, ammonia, engine coolants, and petroleum oils. Neoprene flexes while resisting cracking and resists weather, ozone, tearing, and abrasion. Strong and durable, use these polyurethane O-rings for applications requiring excellent wear and abrasion resistance. They are commonly used for sealing hydraulic cylinders, and can function as light-duty drive belts.